Cricket Update! The order arrived safely and loudly! A chorus of chirping greeted me at the house this afternoon. 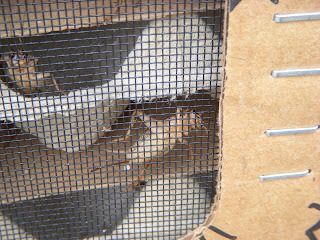 I biked home during my lunch break, (thank goodness I only live two miles away from my office) and found 2 boxes full of 2,000 happy and healthy crickets. I'm sure the delivery person was not amused by these loud packages. Here's a close-up of the full-grown babies! Yikes! I had to put the boxes outside in the backyard, their song making was just too loud and I was concerned that our dog, Hamlet, would go a bit bonkers trying to see, smell and have a smackerel of Jiminy and his 1,999 friends! The plan now - when I get home tonight, after a long day at the office and a shift at Williams-Sonoma, is to have the critters go gently into the night, by introducing them to Mr. Freezer. Please, baby, Please - feel free to leave your (clean) comments here and don't forget to contact me if you are even remotely interested in partaking in the great cricket cook-off of 2008! 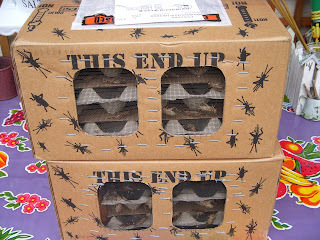 Email me at: dgorniak@comcast.net I'm hoping to hold this cricket tasting expo over the next week. Thanks for the comment! I'm glad to hear of your blog just in time to follow the cricket feast, it sounds fascinating!